We are a group of women from the White City/Emerald Park/Regina area who come from all walks of life but share a love of good books. We were formed in 1999 and our first meeting was held in the White City Library. Our group as grown and shrunk over the years and we now maintain a solid core of 9 devoted readers who also share a love of good food and fine wine. 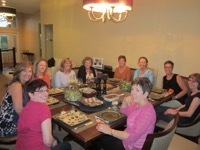 We meet once a month, usually on a Wednesday or Thursday, September through May. June is our windup and also when we select our books for the upcoming year.